Among the most violent known meteorological events are tornadoes. Each year, more than 2,000 tornadoes occur worldwide, with the vast majority occurring in the United States and Europe. In order to assess the intensity of these events, meteorologist Ted Fujita devised a method to estimate maximum winds within the storm based on damage caused; this became known as the Fujita scale. At the top end of the scale, which ranks from 0 to 5, are F5 tornadoes. These storms were estimated to have had winds between 260 mph (420 km/h) and 318 mph (512 km/h). [nb 1] Following two particularly devastating tornadoes in 1997 and 1999, engineers questioned the reliability of the scale. Ultimately, a new scale was devised that took into account 28 different damage indicators; this became known as the Enhanced Fujita scale. With building designs taken more into account, winds in an EF5 tornado were estimated to be in excess of 200 mph (320 km/h). Since 1950, there have been 59 officially rated F5 and EF5 tornadoes in the United States and one F5 in Canada. Additionally, the works of tornado expert Thomas P. Grazulis revealed the existence of several dozen more between 1880 and 1995. Grazulis also put into question the ratings of several currently rated F5 tornadoes. Outside the United States and Canada, seven tornadoes have been rated F5: two each in France, Germany, and Italy and one in Russia. Several other tornadoes are also documented as possibly attaining this status. Since structures are completely destroyed in both cases, the identification and assignment of scale between an EF4 tornado and an EF5 is often very difficult. A map detailing all officially rated F5 and EF5 tornadoes in the United States from 1950 to 2013. The tornadoes on this list have been officially rated F5 by an official government source. Unless otherwise noted, the tornadoes on this list have been rated F5 by the National Weather Service (NWS), as shown in the archives of the Storm Prediction Center and National Climatic Data Center (NCDC). Prior to 1950, assessments of F5 tornadoes are mostly based on the works of Thomas Grazulis. The NCDC accepted 38 of his classifications from between 1880 and 1950 as F5s. In addition to the accepted ones, he rated a further 25 during the same period. From 1950 to 1970 tornadoes were assessed retrospectively, primarily using information recorded in government databases, and newspaper photographs and descriptions. Beginning in 1971, tornadoes were rated by the NWS using on-site damage surveys. For United States tornadoes as of February 1, 2007, the Fujita scale has been recalibrated to more accurately match tornado speeds with their damage and to augment and refine damage descriptors. The new system is called the Enhanced Fujita scale. No earlier tornadoes will be reclassified, and no new tornadoes in the United States will be rated F5. France and Canada later adopted the EF-scale in years following. In all, 63 tornadoes have been officially rated F5/EF5 since 1950: 59 in the United States and one each in Italy, France, Russia, and Canada. The works of Grazulis also revealed 16 more F5 tornadoes between 1950 and 1995, with four later being accepted by the NCDC. Since the implementation of the Enhanced Fujita scale on February 1, 2007, there have been nine officially rated EF5 tornadoes in the United States from May 4th, 2007-May 20th, 2013 to date, while previously fifty tornadoes were officially rated F5 on the original Fujita scale from May 11th, 1953-May 3rd, 1999. Aug 19 1845 FR NOR Montville 75 This tornado was rated T10/11. Several large, stone-built mills were leveled and partly swept clean. One of the mills was a four-story structure that likely collapsed. Debris was carried 25 mi (40 km). ESWD, TORRO, Thomas P.
Apr 24 1880 US IL West Prairie–​Christian County 6 Many "well built" homes were leveled and farms vanished. Its victims (both people and cattle) were reportedly carried up to half a mile. This is the earliest estimated F5 that can be verified in the U.S. according to Grazulis. (The 1953 Waco tornado is the earliest officially rated - see below.) The F5 rating is widely accepted. NWS, NCDC, Thomas P.
Jun 12 1881 US MO Hopkins 2 1881 Hopkins tornado – Two farms were completely swept away. May have been an F5, though rated F4 due to some uncertainty. NCDC, Thomas P.
Jul 15 1881 US MN Renville County 20 1881 Minnesota tornado outbreak - According to Grazulis, this tornado was "probably" an F5. Severe damage occurred in Renville County where five farms were completely swept away. Thomas P.
Jun 17 1882 US IA Grinnell 65 16 farms were blown away and the town of Grinnell was devastated, as well as the Grinnell College campus. Debris was carried 100 mi (160 km). Caused 68 fatalities according to Grazulis. NWS, NCDC, Thomas P.
Aug 21 1883 US MN Rochester 37 1883 Rochester tornado – 10 farms outside the town were leveled, and some homes were swept away. A metal railroad bridge was completely destroyed. NWS, Thomas P.
Apr 1 1884 US IN Oakville 8 Among contemporary meteorologists, this was considered one of the most intense tornadoes observed up to that time. Parts of Oakville "vanished," with house debris scattered for miles. NWS, NCDC, Thomas P.
Jun 15 1892 US MN Faribault County–​Freeborn County–​Steele County 12 1892 Southern Minnesota tornado – Entire farms were obliterated, and house timbers were embedded into the ground 3 mi (4.8 km) away from the foundations. Thomas P.
May 22 1893 US WI Willow Springs 3 Two farm complexes were completely swept away. NCDC, Thomas P.
Jul 6 1893 US IA Pomeroy 71 Well-built homes were swept away in four counties with F5 damage in the town of Pomeroy. Grass was scoured from the ground, and a metal bridge was torn from its supports. A well pump and 40 feet (12 m) of pipe were pulled out of the ground. NWS, NCDC, Thomas P.
Sep 21 1894 US IA Kossuth County 43 Five farms and a home were swept away, leaving little trace. NWS, NCDC, Thomas P.
May 1 1895 US KS Harvey County 8 Farms "entirely vanished," with debris carried for miles. NCDC, Thomas P.
May 3 1895 US IA Sioux County 9 Farms were swept away, with debris carried for miles. NWS, Thomas P.
May 15 1896 US TX Sherman 73 May 1896 tornado outbreak sequence – This was one of the most intense tornadoes of the 19th century according to Grazulis. "Extraordinary" damage occurred to farms and 20 homes that were completely obliterated and swept away. An iron-beam bridge was torn apart and scattered, with one of the beams deeply embedded into the ground. Trees were reduced to debarked stumps, and grass was scoured from lawns in town as well. Several headstones at a cemetery were shattered or thrown up to 250 yards through the air, and a trunk lid from Sherman was found 35 miles away. Reliable reports said that numerous bodies were carried hundreds of yards, and that multiple deaths occurred in 17 different families; seven deaths were in one family alone. NWS, NCDC, Thomas P.
May 17 1896 US KS–​NE Washington County–​Marshall County–​Nemaha County–​Brown County–​Richardson County 25 May 1896 tornado outbreak sequence – An opera house in Seneca was swept away, along with some farms. Entire farms were reportedly swept clean of debris, leaving the areas "bare as the prairie." Damage estimated at $400,000. NWS, Thomas P.
May 25 1896 US MI Ortonville–​Oakwood 47 May 1896 tornado outbreak sequence – Houses and farms were leveled and swept away, with debris carried up to 12 mi (19 km) away. Trees were completely debarked, with even small twigs stripped bare in some cases. NWS, NCDC, Thomas P.
May 18 1898 US WI Marathon County 12 12 farms were flattened. Timber losses totaled 100 million board feet. Thomas P.
Jun 12 1899 US WI St. Croix County–​New Richmond 117 New Richmond tornado – This tornado devastated New Richmond, leveling or sweeping away many homes and businesses. A large section of the town was reduced to nothing but scattered debris and house foundations. The three-story, brick Nicollet Hotel was completely leveled to the ground. Numerous trees were completely debarked and shorn of their branches. A 3,000-pound (1,361 kg) safe was carried a full block. Thomas P.
May 10 1905 US OK Snyder 97 Snyder, Oklahoma tornado – The town of Snyder was devastated, with many structures swept away. A piano was found in a field 8 mi (13 km) outside town, and debris was carried 60 mi (97 km) away. NWS, NCDC, Thomas P.
Jun 5 1905 US MI Colling 5 Three farms were "wiped out of existence" with only "bits of kindling" remaining on the foundations. Thomas P.
Apr 23 1908 US NE Cuming County, Thurston County 3 1908 Dixie tornado outbreak – A well-built two-story home was swept away. NCDC, Thomas P.
May 12 1908 US IA Fremont County, Page County 0 Five farms had all buildings swept away, homes were "absolutely reduced to kindling," and lumber was scattered for miles. NCDC, Thomas P.
Jun 5 1908 US NE Fillmore County 11 Farms vanished, with little left to indicate farmsteads ever existed at some locations. NCDC, Thomas P.
Jun 15 1912 US MO Creighton 5 Two large homes were completely swept away. Thomas P.
Mar 23 1913 US NE Omaha 113 March 1913 tornado outbreak sequence – Photo analysis by Grazulis revealed possible F5 damage with many empty foundations throughout Omaha, though it is uncertain if this was a result of the tornado or cleanup efforts following the event. An F4 rating was assigned due to the uncertainty. Thomas P.
Jun 11 1915 US KS Kiowa County 0 One entire farm was swept completely away. NCDC, Thomas P.
May 25 1917 US KS Andale, Sedgwick 23 May–June 1917 tornado outbreak sequence – Many structures were swept away, and trees were debarked. The F5 rating is widely accepted. NCDC, Thomas P.
May 21 1918 US IA Crawford County, Greene County 6 At least two farms were swept away, and house foundations were left bare. Mattresses from the homes were transported 2 mi (3.2 km). NWS, NCDC, Thomas P.
May 21 1918 US IA Boone County, Story County 9 A large tornado completely swept away two entire farms. Mentioned as a possible F5 by Grazulis. Thomas P.
Jun 22 1919 US MN Fergus Falls 59 1919 Fergus Falls tornado – This tornado produced extreme damage in Fergus Falls. A three-block-wide swath was leveled, with some homes swept away. Several summer homes were swept away into Lake Alice. A train station was swept away, railroad tracks were ripped from the ground, and a large three-story hotel was completely leveled. Numerous small trees were completely debarked. NCDC, Thomas P.
Mar 28 1920 US IN, OH Jackson Township, West Liberty, Van Wert 17 1920 Palm Sunday tornado outbreak – Farms were leveled and swept away in Indiana and Ohio. Some homes had their floors dislodged and moved some distance. Mentioned as a possible F5 by Grazulis. NWS, Thomas P.
Apr 20 1920 US MS, AL Clay County, Marion County, Lawrence County 88 April 1920 tornado outbreak – This large, long-tracked tornado struck the same areas as the EF5 tornado in 2011, passing near Hackleburg and Phil Campbell, Alabama. Many homes were swept away and entire forests were leveled as the tornado tracked for 130 mi (210 km). Large boulders were picked up and thrown, and part of one was found 11 mi (18 km) away from where it originated. Vehicles were thrown hundreds of yards. May have gained F5 strength, however this is uncertain. Thomas P.
Jul 22 1920 CA SK Frobisher, Alameda 4 "Splendid homes" were swept away and "reduced to splinters." Thomas P.
Mar 11 1923 US TN Pinson 20 An entire section of the town was swept away. Bodies or body parts were found up to 1 mi (1.6 km) away. This is the first of only two F5s to hit Tennessee, the other having struck Lawrence County on April 16, 1998. NCDC, Thomas P.
May 14 1923 US TX Big Spring 23 A large ranch home and farms were swept away. Thomas P.
Jun 24 1923 US ND Hettinger 8 Some ranch home's had possible F5 damage. Thomas P.
Sep 21 1924 US WI Clark County, Taylor County 18 20 farms were destroyed, some of which were obliterated. An entire wall of a home was carried for 14 mi (23 km). Considered to be a possible F5 by Grazulis. Thomas P.
Mar 18 1925 US MO, IL, IN Ellington, Annapolis, Biehle, Gorham, Murphysboro, De Soto, West Frankfort, Parrish, Griffin, Owensville, Princeton 695 Tri-State Tornado – This was the deadliest and longest-tracked single tornado in U.S. history, producing the highest tornado-related death toll in a single U.S. city (234, at Murphysboro, Illinois) and the largest such toll in a U.S. school (33, at Desoto, Illinois). Thousands of structures were destroyed, with hundreds of homes swept away along the path, especially in Illinois and Indiana. The towns of Murphysboro, West Frankfort, Gorham and Griffin were devastated, along with numerous other small towns and communities. Gorham and Griffin were 100% destroyed, with every single structure in Gorham leveled or swept away. Trees were debarked, debris was finely granulated, and deep ground scouring was noted in several areas as well. A Model T Ford was thrown a long distance and stripped, railroad tracks were ripped from the ground at multiple locations along the path, and a large multi-ton coal tipple was blown over and rolled. The F5 rating is widely accepted. NWS, NCDC, Thomas P.
Jun 3 1925 US IA Pottawattamie County, Harrison County 0 19 buildings on two farms reportedly "vanished". This tornado took nearly the same path as the next one, below. May have been a "possible" F5. Thomas P.
Jun 3 1925 US IA Pottawattamie County, Harrison County 1 Parts of two farms and some homes swept away, but they may have been hit by both tornadoes, thus the uncertainty of a possible F5. Thomas P.
Apr 12 1927 US TX Rocksprings 74 This massive tornado swept away or leveled 235 out of 247 structures, more than 90% of the town, killing or injuring a third of the population. Many of the structures were reduced to bare foundations, leaving "no trace of lumber or contents." Acres of ground were "swept bare" in some parts of town. NWS, Thomas P.
May 7 1927 US KS Barber County, McPherson County 10 Many farms were destroyed and some were swept completely away. The F5 rating is widely accepted. NCDC, Thomas P.
Sep 13 1928 US NE Cuming County, Thurston County, Dakota County 5 Three rural schools houses were completely obliterated, at least one was "swept entirely away". "Possible" F5 damage, according to Grazulis, was in an area where two farms "were completely leveled". 66 homes and at least another 450 buildings were damage or destroyed. The tornado caused $1,000,000 in damages. Thomas P.
Apr 10 1929 US AR Sneed 23 This tornado is considered the only F5 on record in Arkansas. It destroyed the Sneed community, reduced homes to "splinters", and made a "clean sweep" of the area. Huge trees were snapped or torn apart. NWS, Thomas P.
Jul 20 1931 PL LU Lublin 6 This tornado is officially rated F4; however, the Polish Weather Service estimated winds at 246 to 324 mph (396 to 521 km/h), potentially ranking it as an F5. ESWD? May 22 1933 US NE Tryon 8 Two farms were swept away. NCDC, Thomas P.
Jul 1 1935 CA SK Benson 1 Several structures were leveled. Thomas P.
Apr 5 1936 US MS Tupelo 216 Tupelo-Gainesville tornado outbreak – This tornado leveled and swept away many large and well-constructed houses, killing entire families. A concrete war monument was toppled and broken, with nearby brick gate posts snapped off at the base. Granulated structural debris was scattered and wind-rowed for miles east of the city. Pine needles were reportedly driven into tree trunks as well. NWS, Thomas P.
Apr 26 1938 US NE Oshkosh 3 A school disintegrated, and two farms were swept away. Dead bodies were carried .25 mi (0.40 km) away. NCDC, Thomas P.
Jun 10 1938 US TX Clyde 14 All nine homes in a small subdivision "literally vanished", with bodies carried up to .50 mi (0.80 km) away. A car engine, found nearby, was carried for a similar distance. 19 railroad cars were "tossed like toys." Thomas P.
Apr 14 1939 US OK, KS Woodward County, Barber County 7 Homes and entire farms were swept away, and cars were carried for hundreds of yards. NCDC, Thomas P.
Apr 7 1940 US LA Amite 3 This tornado produced possible F5 damage to a "large new home," killing the couple inside. Another violent tornado hit Amite on April 24, 1908. Thomas P.
Mar 16 1942 US IL Peoria County, Marshall County 8 March 1942 tornado outbreak – Many homes were swept away in the town of Lacon, Illinois, and a farmhouse sustained F5 damage. NWS, NCDC, Thomas P.
Apr 29 1942 US KS Oberlin 15 Three farms were obliterated, with all buildings and several inches of topsoil swept away. Debris from homes was granulated into splinters "no larger than match sticks." NCDC, Thomas P.
Jun 17 1944 US SD Summit 8 Farms were swept away with no visible debris left. Thomas P.
Apr 12 1945 US OK Antlers 69 600 buildings were destroyed, and some areas were swept clean of all debris. The F5 rating is widely accepted. NCDC, Thomas P.
Apr 9 1947 US TX, OK, KS Glazier, Higgins, Woodward 181 1947 Glazier-Higgins-Woodward tornadoes – Several towns were partially or totally destroyed. Most structures in Glazier were swept away, where shrubbery was debarked, ground scouring occurred, and vehicles were thrown hundreds of yards. In Higgins, a 4½ ton lathe was ripped from its anchors and broken in half. A 20-ton boiler tank in Woodward was thrown a block and a half. The F5 rating is widely accepted. NWS, NCDC, Thomas P.
Apr 29 1947 US MO Worth 14 Most of Worth was destroyed. Half of a brick building remained standing in the village. Considered to be a possible F5 by Grazulis. Thomas P.
May 31 1947 US OK Leedey 6 This tornado reportedly left more intense damage than the previous event did in Woodward. Many structures were swept away, leaving no debris or grass in some areas. Yards at some residences were stripped of their lawns and all vegetation, and several inches of topsoil were removed as well. The F5 rating is widely accepted, though the tornado was very slow-moving, which may have exacerbated the level of destruction to some extent. Thomas P.
May 18 1951 1645 US TX Olney 2 Many homes in town were destroyed, some of which were swept away with very little debris left. Thomas P.
May 22 1952 1810 US KS Linwood–​Edwardsville 0 This tornado moved at 70 miles per hour (110 km/h) and destroyed dozen homes. The home of a bank president was leveled. Grazulis notes it as "possibly F5." Thomas P.
May 11 1953 1610 US TX Waco–​Bellmead 114 1953 Waco tornado outbreak – Many large, multi-story buildings in downtown Waco were completely leveled, along with homes both north and south of Waco. First officially ranked F5 tornado in the U.S. SPC, NWS, NCDC, Thomas P.
Jun 8 1953 2030 US MI Flushing Township–​Mount Morris Township–​Beecher–​Genesee Township 116 Flint-Worcester tornado outbreak sequence – Entire blocks of homes were completely swept away, with only rows of bare slabs and empty basements remaining. Cycloidal ground scouring occurred as well. SPC, NWS, NCDC, Thomas P.
Jun 8 1953 1900 US OH Cygnet 18 Flint–Worcester tornado outbreak sequence – Possible but unverifiable F5 damage occurred near Cygnet where homes were swept completely away. A steel-and-concrete bridge was destroyed as the tornado passed near Jerry City. Thomas P.
Jun 9 1953 1625 US MA Worcester 94 Flint-Worcester tornado outbreak sequence – Many strong structures with numerous interior walls were leveled, and entire blocks of homes were swept cleanly away. The large, brick Assumption College sustained severe damage, and its upper stories were completely destroyed. A large, multi-ton storage tank was carried over a road, and trees along the path were debarked as well. Debris from this tornado was found in the Atlantic Ocean. The tornado was rated F5 by Grazulis in a later publication. Thomas P.
Jun 27 1953 1545 US IA Adair 1 Four farms were destroyed, with virtually nothing left at one of them. Heavy machinery was thrown hundreds of feet, and boards were driven into trees. SPC, NWS, NCDC, Thomas P.
May 1 1954 1515 US TX–​OK Crowell–​Vernon–​Snyder 0 Vehicles were thrown more than 100 yd (300 ft), and three farms were entirely swept away. Thomas P.
May 25 1955 2126 US OK–​KS Blackwell 20 1955 Great Plains tornado outbreak – Many homes and businesses were swept away in town. SPC, NWS, NCDC, Thomas P.
May 25 1955 2215 US OK–​KS Udall 80 1955 Great Plains tornado outbreak – Many homes and businesses were swept away in town. Vehicles were thrown and stripped down to their frames, including a pickup truck that was partially wrapped around a tree. A 30 foot (9.1 m)-by-40-foot (12 m) concrete block building was obliterated, with the foundation left mostly bare. Beams were also broken at a school building, and numerous trees were debarked. SPC, NWS, NCDC, Thomas P.
Jul 2 1955 1900 US ND Walcott 2 Eleven farms were completely leveled or swept away. One farm appeared to show potential F5 damage to a home that was swept completely away. Thomas P.
Apr 3 1956 1830 US MI Hudsonville–​Grand Rapids 18 April 1956 Hudsonville-Standale tornado – Many homes were swept completely away, leaving bare foundations behind. Extensive wind-rowing of debris was observed, and vehicles were tossed hundreds of yards as well. One home that was swept away had all of its tile flooring scoured from the foundation. Grazulis lists this tornado as an F4 but notes that it "probably produced F5 damage." SPC, NWS, NCDC, Thomas P.
May 20 1957 1815 US KS–​MO Spring Hill–​Martin City–​Raytown–​Hickman Mills–​Ruskin Heights 44 May 1957 Central Plains tornado outbreak – Entire rows of homes were swept away, with extensive wind-rowing of structural debris noted in nearby fields. Some homes had their anchor-bolted subflooring swept away as well, leaving only empty basements behind. A steel-reinforced school was partially leveled, and many shops and businesses sustained F5 damage. F4 damage occurred in both Kansas and Missouri, but the F5 damage was in Ruskin Heights and Hickman Mills. SPC, NWS, NCDC, Thomas P.
May 21 1957 1653 US MO Fremont 7 May 1957 Central Plains tornado outbreak – Most of Fremont was destroyed, with many structures swept away. Possible F5 damage occurred to schools, homes, and businesses near the railroad tracks, but could not be verified due to poor quality of construction. Thomas P.
Jun 20 1957 1828 US ND–​MN Fargo–​Moorhead 12 1957 Fargo tornado – Many homes were leveled, with some swept completely away. Part of the Golden Ridge subdivision was swept away, with the debris scattered long distances into nearby fields. Fujita reportedly called this more intense than the 1965 Palm Sunday tornadoes he surveyed, some of which he rated F5 in the Chicago Damage Area Per Path Length (DAPPL). SPC, NWS, NCDC, Thomas P., Tetsuya T.
Dec 18 1957 1635 US IL Sunfield 1 December 1957 tornado outbreak sequence – The entire Sunfield community "vanished." SPC, NWS, NCDC, Thomas P.
Jun 10 1958 1845 US KS El Dorado 15 Reports indicated near-F5-level damage to homes. A car was thrown 100 yd (300 ft), but damage photographs were inconclusive as to whether F5 structural damage occurred. Thomas P.
May 5 1960 1700 US OK Prague 5 May 1960 tornado outbreak sequence – Homes were swept away, and heavy oil tanks were thrown long distances. Hillsides were stripped of most vegetation and up to 6 in (0.15 m) of topsoil. SPC, NWS, NCDC, Thomas P.
May 19 1960 1747 US KS Wamego 0 Rated F5 by Grazulis as two farms were swept away. Thomas P.
May 30 1961 1700 US NE Custer County–​Valley County 0 All buildings and machinery were swept away from a farm. Widely accepted as an F5 tornado, including within the NCDC Technical Memorandum; however, it is listed as an F4 in the official databases. NCDC, Thomas P.
Apr 3 1964 1435 US TX Wichita Falls 7 Homes were swept away, and a boxcar was thrown 100 yd (300 ft). A car was thrown a block and a half. SPC, NWS, NCDC, Thomas P.
Apr 12 1964 1700 US KS Near Lawrence 0 Produced possible F5 damage according to Grazulis. Farms were leveled and a truck was thrown 300 yd (274 m). Thomas P.
May 5 1964 1830 US NE Bradshaw 4 Numerous farms were swept away. SPC, NWS, NCDC, Thomas P.
Apr 11 1965 1815 US IN Midway 14 1965 Palm Sunday tornado outbreak – This was the first of two violent tornadoes to hit the Dunlap area, north of Goshen. Homes were swept away, and an airplane wing was found 35 miles (56 km) away in Michigan. This tornado was famously photographed as a double tornado. Thomas P.
Apr 11 1965 1840 US IN Rainbow Lake 5 1965 Palm Sunday tornado outbreak – This tornado developed after the first Dunlap tornado (previous event). Possible F5-level damage occurred to homes that were swept away. Thomas P.
Apr 11 1965 1910 US IN Dunlap 36 1965 Palm Sunday tornado outbreak – This was the second violent tornado to strike Dunlap within 90 minutes. A well-built truck stop was leveled and many permanent homes were swept away in two subdivisions. Rated F5 by Fujita in the Chicago Damage Area Per Path Length (DAPPL), but later downgraded to F4, the tornado is widely considered to be an F5 in older sources. NCDC, Thomas P., Tetsuya T.
Apr 11 1965 2130 US OH Toledo 18 1965 Palm Sunday tornado outbreak – Homes were completely swept away with borderline-F5 damage in North Toledo. Boats and buses were thrown into and onto buildings. Rated F5 originally by Fujita in the Chicago Damage Area Per Path Length (DAPPL), and by the NWS, but later downgraded to an F4, although Grazulis' research says the tornado caused F5 damage. Thomas P., Tetsuya T.
Apr 11 1965 2305 US OH Pittsfield–​Strongsville 18 1965 Palm Sunday tornado outbreak – Homes were cleanly swept away in Strongsville and Pittsfield, and Pittsfield was completely destroyed. Only a concrete war monument remained standing in Pittsfield, where homes "vanished." Rated F5 by Fujita in the Chicago Damage Area Per Path Length (DAPPL), but later downgraded to F4, though widely considered to be F5 in older reports. Thomas P., Tetsuya T.
May 8 1965 1730 US NE Primrose 4 Early-May 1965 tornado outbreak sequence - Widely accepted as an F5, and reported to have been a double tornado as it hit Primrose. Homes were swept from their foundations, and 90% of the village was destroyed. Cars from Primrose were carried for 400 yd (1,200 ft), and a truck body was carried and rolled for 2 mi (3.2 km). NCDC, Thomas P.
May 8 1965 1715 US SD Gregory 0 Early-May 1965 tornado outbreak sequence - Many farms were destroyed, including three that were swept completely away. SPC, NWS, NCDC, Thomas P.
Mar 3 1966 1600 US MS Jackson 57 1966 Candlestick Park tornado – Homes were swept away, and a brick church was obliterated. Pavement was scoured from roads, and cars were thrown more than half a mile from where they originated. The newly built Candlestick Park shopping center was leveled, and concrete masonry blocks were scattered for long distances. Steel girders were "twisted like wet noodles" at a glass plant. SPC, NWS, NCDC, Thomas P.
Jun 8 1966 1900 US KS Topeka 16 1966 Topeka tornado – Entire rows of homes were swept away, vehicles were thrown long distances, and grass was scoured from lawns. SPC, NWS, NCDC, Thomas P.
Apr 23 1968 1341 US KY Falmouth 6 1968 Wheelersburg, Ohio tornado outbreak - Mentioned as a possible F5 by Grazulis. Thomas P.
May 15 1968 1510 US IA Charles City 13 May 1968 tornado outbreak – Many homes were swept away in town. Farms were swept away as well, and very intense multiple vortices were observed based upon ground damage patterns. Cycloidal ground scouring occurred where the multiple vortices were noted. SPC, NWS, NCDC, Thomas P.
May 15 1968 1557 US IA Oelwein–​Maynard 5 May 1968 tornado outbreak – Homes were swept completely away in both towns. SPC, NWS, NCDC, Thomas P.
Jun 13 1968 1850 US MN Tracy 9 1968 Tracy tornado – 111 homes were destroyed in town, with some swept away. A heavy boxcar was thrown more than a full block, and two others were thrown 300 yd (900 ft). A steel I-beam was carried for two miles on a piece of roof. Extensive ground scouring occurred outside of town, and several farms were swept completely away. SPC, NWS, NCDC, Thomas P.
May 11 1970 2035 US TX Lubbock 26 1970 Lubbock tornado – Homes were swept away and a high-rise building suffered structural deformation. A 13-tonne (28,660 lb) metal fertilizer tank was thrown nearly 1 mi (1.6 km) through the air, and large oil tanks were carried for over 300 yd (900 ft). SPC, NWS, NCDC, Thomas P.
May 6 1973 1925 US TX Valley Mills 0 Rating applied by wind engineers. A pickup truck was carried .5 mi (0.80 km) through the air. Another was carried for 200 yd (600 ft). SPC, NWS, NCDC, Thomas P.
Apr 3 1974 1420 US IN Depauw–​Daisy Hill 6 1974 Super Outbreak – Homes were swept completely away, and entire farms were leveled. SPC, NWS, NCDC, Thomas P.
Apr 3 1974 1530 US OH Xenia 32 1974 Super Outbreak – Aerial photography and isoline surveys by Fujita showed that entire rows of brick homes were swept away and sustained F5 damage. Wind-rowing of debris occurred in nearby fields, and very intense damage was reported to steel-reinforced schools. SPC, NWS, NCDC, Thomas P., Tetsuya T.
Apr 3 1974 1625 US KY–​IN Hardinsburg–​Brandenburg–​Harrison County 31 1974 Super Outbreak – Multiple well-built, anchor bolted homes were swept away, including one that sustained total collapse of its poured concrete walk-out basement wall. Grass was scoured from the ground, and aerial photography showed extensive wind-rowing in Brandenburg. Trees were completely debarked, and low-lying shrubs next to leveled homes were uprooted and stripped. Multiple vehicles were also thrown hundreds of yards and stripped down to their frames. SPC, NWS, NCDC, Thomas P.
Apr 3 1974 1730 US IN–​KY–​OH Rising Sun–​Boone County–​Sayler Park (West Cincinnati)–​Mack–​Bridgetown 3 1974 Super Outbreak – Homes were swept away, and a large floating restaurant barge was lifted, ripped from its moorings, and flipped upside-down by the tornado. Boats and vehicles were carried long distances through the air. SPC, NWS, NCDC, Thomas P.
Apr 3 1974 1815 US AL Mount Hope–​Tanner–​Harvest 28 1974 Super Outbreak – Numerous homes were swept away and scattered. In Limestone County, where the F5 damage occurred, a large swath of trees was leveled, and ground scouring occurred nearby with dirt found to have been dug up and plastered to the bark, and a pump was lifted out of a well at one location. Shrubbery was debarked as well. SPC, NWS, NCDC, Thomas P.
Apr 3 1974 2050 US AL Guin–​Twin–​Delmar 28 1974 Super Outbreak – According to the NWS in Birmingham, Alabama, this is considered one of the strongest tornadoes ever to impact the United States. Sources indicate that F5 damage was reported along much of the path, and that many homes in and near Guin sustained F5 damage. Many of these homes were swept away, their debris being scattered across fields, and some reportedly had their "foundations dislodged and in some cases swept away as well." Nothing was left of the Guin Mobile Home Plant but a pile of mangled beams. Additionally, photographs showed intense wind-rowing from suction vortices. The path of the tornado was visible from satellite, as thousands of trees, including in the Bankhead National Forest, were snapped. SPC, NWS, NCDC, Thomas P.
Jun 13 1976 1410 US IA Jordan 0 Homes were swept away. This tornado was mentioned by Fujita as one of the most intense he surveyed. Well-built farms reportedly vanished without a trace. SPC, NWS, NCDC, Thomas P., Tetsuya T.
Apr 4 1977 1640 US AL Birmingham–​Tarrant 22 April 1977 Birmingham tornado – Many homes were swept away, some of which had all of their cinder block walk-out basement walls completely swept away as well. Trees were debarked and two dump trucks were thrown through the air. SPC, NWS, NCDC, Thomas P.
Jun 7–8 1984 2341 US WI Barneveld–​Black Earth 9 Barneveld, Wisconsin tornado outbreak – A cul-de-sac of newly built homes was swept away, and vehicles were thrown hundreds of yards. Small trees were debarked as well. SPC, NWS, NCDC, Thomas P.
May 31 1985 1730 US OH–​PA Niles–​Wheatland 18 1985 United States-Canadian tornado outbreak – This tornado caused F5 damage along much of its path through Niles and Wheatland. A shopping center in Niles was obliterated, sustaining F5 damage and several deaths. Metal girders at the center twisted and buckled. Well-built, anchor bolted homes were swept away, and 75,000-pound (34,020 kg) petroleum storage tanks were ripped from their anchors and thrown hundreds of feet. Pavement was scoured from a parking lot, and a steel-frame trucking plant was obliterated and partially swept away with the beams severely mangled. Routing slips from the plant were found wedged into the remaining asphalt of parking lot. An airplane wing was carried 10 miles from where it originated. As of 2018 it is the only F5 or EF5 in Pennsylvania history. SPC, NWS, NCDC, Thomas P.
Mar 13 1990 1634 US KS Castleton–​Haven–​Burrton–​Hesston 1 March 1990 Central US tornado outbreak – Many homes and businesses were swept away in town with only slabs and empty basements remaining, industrial buildings were obliterated, and vehicles were thrown hundreds of yards and stripped down to their frames. SPC, NWS, NCDC, Thomas P.
Mar 13 1990 1634 US KS Goessel 1 March 1990 Central US tornado outbreak – Homes were obliterated and swept away, but the F5 rating was assigned due to very intense cycloidal ground scouring. Considered by some sources to be one of the strongest tornadoes ever surveyed at the time, though little detailed information about the damage is available. SPC, NWS, NCDC, Thomas P.
Aug 28 1990 1430 US IL Oswego–​Plainfield–​Joliet 29 1990 Plainfield tornado – Rain-wrapped tornado. A mature corn crop was scoured from the ground, leaving nothing but bare soil behind. Several inches of topsoil were blown away as well. A 20-tonne (20,000 kg) tractor trailer was tossed from a road and thrown more than half a mile, and vehicles were picked up and carried through the air. The F5 rating is based solely upon the extreme ground scouring; as areas in Plainfield sustained high-end F4 structural damage, though the ground scouring nearby was much less intense than where the corn crop was obliterated. Fujita considered the intensity of the ground scouring "comparable to the worst he had seen." SPC, NWS, NCDC, Thomas P., Tetsuya T.
Apr 26 1991 1655 US KS Haysville–​McConnell Air Force Base–​Andover–​El Dorado Lake 17 April 26, 1991 tornado outbreak – Many large, well-built homes with anchor bolts were swept away, leaving bare foundations behind, and grass was scoured from the ground. Extensive wind-rowing of debris occurred, leaving streaks of debris extending away from empty foundations. Trees and small twigs were completely stripped of their bark. Vehicles were thrown up to .75 mi (1.2 km) from where they originated and were mangled beyond recognition. SPC, NWS, NCDC, Thomas P.
Apr 26 1991 1830 US OK Red Rock 0 April 26, 1991 tornado outbreak – Mobile Doppler radar used by storm chasers indicated wind speeds in the range of the F5 threshold, with winds up to 286 mph (460 km/h). Pavement and ground scouring occurred, and a large oil rig was toppled. Officially rated F4, rating is disputed. Thomas P.
Jun 16 1992 1600 US MN Chandler–​Lake Wilson 1 Mid-June 1992 tornado outbreak – Multiple homes were swept away, and vehicles were thrown and stripped down to their frames. SPC, NWS, NCDC, Thomas P.
Jun 8 1995 1835 US TX Pampa 0 On June 8, 1995, a violent tornado hit the industrial section on the west side of Pampa, destroying or damaging about 250 businesses and homes. It resulted in $30 million in damage and was the costliest and the most destructive tornado on record for this town. It had a three-mile path and was two hundred yards wide. At its peak, it was rated an F4 on the Fujita Scale. Out of all the videos taken of this tornado, the most famous came from a local sheriff, Randy Stubblefield, who used his dashboard camera to videotape the twister. At one point in the video, the tornado lifted and hurled a van and a couple of flattened pick-up trucks into the air. In spite of the tornado's intensity, there were no deaths. Winds of around 250 to 300 MPH were mesured using photogrammetry. Thomas P.
Jun 8 1995 1835 US TX McLean–​Kellerville 0 Project VORTEX assessed tornado to be F5; one home was so obliterated that the National Weather Service survey likely missed it. Intense pavement and ground scouring occurred, with only bare soil left in some areas. VORTEX, Thomas P.
Jul 18 1996 1805 US WI Oakfield 0 1996 Oakfield tornado – Well-built homes with anchor bolts were swept away, including one where rebar supports were bent over at a 90-degree angle. Vehicles were thrown up to 400 yd (1,200 ft) through the air and mangled beyond recognition. Crops were scoured to 1-inch stubble. SPC, NWS, NCDC, Thomas P.
May 27 1997 1440 US TX Jarrell 27 1997 Central Texas tornado outbreak – Produced some of the most extreme damage ever documented. An entire subdivision of well-built homes was swept completely away with very little debris remaining. Some of the homes were well-bolted to their foundations. Long expanses of pavement was torn from roads, and a large swath of ground was scoured out to a depth of 18 in (0.46 m). Vehicles were torn apart and scattered across fields, and a recycling plant was obliterated. Tornado was very slow-moving, which may have exacerbated the destruction to some extent. SPC, NWS, NCDC, Thomas P.
Apr 8 1998 1842 US AL Oak Grove–​Sylvan Springs–​Pleasant Grove–​Edgewater–​Birmingham 32 April 1998 Birmingham tornado – Many homes were swept away along the path. SPC, NWS, NCDC, Thomas P.
Apr 16 1998 1615 US TN Wayne County–​Lawrence County 0 1998 Nashville tornado outbreak – This tornado produced extreme damage at ground level. Many large and well-built homes with anchor bolts were swept away, and vehicles were thrown hundreds of yards. A swath of grass 200 ft (67 yd) wide was scoured from the ground, with nothing but bare soil and clumps of dirt remaining. SPC, NWS, NCDC, Thomas P.
May 11 1999 1805 US TX Loyal Valley 1 Officially rated high-end F4, though one survey revealed potential F5 damage. Two homes were completely swept away, with debris scattered over great distances. Large pieces of a pickup truck were found 3/4 of a mile away from the residence where it originated, and a 720-foot long stretch of pavement was scoured from a road. Ground scouring occurred, and numerous mesquite trees were completely denuded and debarked. A reporter who also witnessed the destruction at Jarrell said "I hadn't seen anything like that. I couldn't believe what it did to animals, This was wiped clean, too, but the cattle - their hides had been ripped right off of them. Some of them were missing heads, and some were caught up and entwined in barbed wire." Had this tornado touched down in an urban area, the devastation likely would have rivaled that from Oklahoma City or the storm that leveled a subdivision in Jarrell in 1997. Bill H.
May 4 2007 2100 US KS Greensburg 11 May 2007 tornado outbreak – This tornado destroyed 95% of the town, including seven well-built homes with anchor bolts that were swept away. Vehicles were thrown hundreds of feet, several freight train cars were overturned, and multi-ton oil tanks were destroyed. Trees were completely denuded and debarked as well. 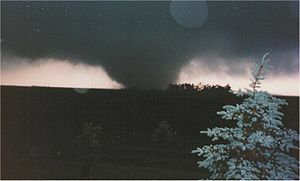 This was the first tornado to have been rated EF5 after the retirement of the original Fujita Scale in the United States in February 2007. Winds inside according to velocities were 230 knots (between 264 and 265 mph) making it well above the EF5 threshold. Also a field near town was heavily scoured. SPC, NWS, Timothy P.
May 22 2011 1734 US MO Joplin–​Duquesne 158 2011 Joplin tornado – Deadliest tornado in the United States since 1947. Many homes, business, and steel frame industrial buildings were swept away, and large vehicles including semi-trucks and buses were thrown hundreds of yards. A large multi-story hospital had its foundation and underpinning system so severely damaged that it was structurally compromised and had to be torn down. Reinforced concrete porches were deformed, lifted, and tossed, and 300-pound (136 kg) concrete parking stops anchored with rebar were ripped from parking lots and tossed well over 100 ft (30 m). Vehicles were thrown several blocks away from the residences where they originated, and a few were never recovered. Damage to driveways was noted at some residences as well. A large steel-reinforced concrete "step and floor structure" leading to one building was warped slightly and cracked. Ground and pavement scouring occurred, and heavy manhole covers were removed from roads as well. On June 10, 2013, an engineering study found no evidence of EF5 structural damage in Joplin due to the poor quality of construction of many buildings. However, the EF5 rating stood as the National Weather Service in Springfield, Missouri, stated that survey teams found only a very small area of EF5 structural damage (at and around the hospital) and that it could have easily been missed in the survey, and the EF5 rating was mainly based on large vehicles being thrown long distances, along with non-conventional, non-structural instances of damage, such as removal of manhole covers, pavement, concrete porches, driveways, and parking stops, and the presence of wind-rowed debris. SPC, NWS, Timothy P.
May 20 2013 1456 US OK Newcastle–​Moore 24 2013 Moore tornado – Many homes were swept away, including nine that were well-built and bolted to their foundations and two elementary schools were completely destroyed. Extensive ground scouring occurred with only bare soil left in some areas, and a 10-ton propane tank was thrown more than half a mile through the air. Trees and shrubs were completely debarked, wind-rowing of debris was noted, and an oil tank was thrown a full mile from a production site, while another was never found. A manhole cover was removed near Moore Medical Center, and vehicles were thrown hundreds of yards and torn into multiple pieces. SPC, NWS, Timothy P.
Apr 27 2014 1906 US AR Mayflower–​Vilonia 16 Tornado outbreak of April 27–30, 2014 – Officially rated high-end EF4, though the rating was a major source of controversy, and meteorologist/civil engineer Timothy P. Marshall noted that the rating assigned was "lower-bound", and also noted "the possibility that EF5 winds could have occurred" despite the structural flaws responsible for the EF4 rating. Numerous homes were swept completely away with only bare slabs left, including one that was well-bolted to its foundation, and extensive wind-rowing of debris occurred. Trees were completely debarked and denuded, shrubs were shredded and debarked, and vehicles were thrown hundreds of yards and stripped down to their frames. A large 29,998-pound metal fertilizer tank was found approximately 3/4 of a mile away from where it originated. Extensive ground scouring occurred as well. NWS, Timothy P.
^ The winds estimated by the Fujita Scale are estimated values and have not been verified scientifically. ^ a b All official F5 tornadoes in the United States are based on the Storm Prediction Center's list of F5 and EF5 tornadoes. ^ "U.S. Tornado Climatology". National Climatic Data Center. National Oceanic and Atmospheric Administration. May 20, 2013. Retrieved June 24, 2013. ^ Paul Rincon (July 11, 2003). "UK, Holland top twister league". British Broadcasting Company. Retrieved June 25, 2013. ^ a b "Fujita Tornado Damage Scale". Storm Prediction Center. National Oceanic and Atmospheric Administration. 2006. Retrieved June 25, 2013. ^ "The Enhanced Fujita Scale (EF Scale)". Storm Prediction Center. National Oceanic and Atmospheric Administration. August 4, 2011. Retrieved June 25, 2013. ^ "Enhanced F Scale for Tornado Damage". Storm Prediction Center. National Oceanic and Atmospheric Administration. 2013. Retrieved June 25, 2013. ^ a b c d e f g h i j k l m n o p q r s t u v w x y z aa ab ac ad ae af ag ah ai aj ak al am an ao ap aq ar as at au av aw ax ay az ba bb bc bd be bf bg bh bi bj bk bl bm bn bo Grazulis, Thomas P. (July 1993). Significant Tornadoes 1680-1991. A Chronology and Analysis of Events. St. Johnsbury, VT: The Tornado Project of Environmental Films. ISBN 1-879362-03-1. ^ Grazulis, Significant Tornadoes, 143–45; 147–48. ^ a b c "F5 and EF5 Tornadoes of the United States". Storm Prediction Center. National Oceanic and Atmospheric Administration. 2013. Retrieved June 25, 2013. ^ a b c d e f g h i j k l m n o p q r s t u v w x y z aa ab ac ad ae af ag ah ai aj ak al am an ao ap aq ar as at au av aw ax ay az Neal Lott; Sam McCown & Tom Ross (August 2000). "1998-1999 Tornadoes and a Long-Term U.S. Tornado Climatology" (PDF). National Climatic Data Center. National Oceanic and Atmospheric Administration. Retrieved June 26, 2013. ^ a b c d e f g h i j k l m n o p q r s t u v w x y z aa ab ac ad ae af ag ah ai aj ak al am an ao ap aq ar as at au av aw ax ay az ba bb bc bd be bf bg bh bi bj bk bl bm bn bo bp bq br bs bt bu bv bw bx by bz ca cb cc cd ce cf cg ch ci cj ck cl cm cn co cp cq cr cs ct cu cv cw cx cy cz da db dc dd de df dg dh di dj dk dl Grazulis, Thomas P. (2001). F5-F6 Tornadoes. St. Johnsbury, VT: The Tornado Project. ^ McDonald, James R. (January 2001). "T. Theodore Fujita: His Contribution to Tornado Knowledge through Damage Documentation and the Fujita Scale". Bulletin of the American Meteorological Society. American Meteorological Society. 82 (1): 63–72. Bibcode:2001BAMS...82...63M. doi:10.1175/1520-0477(2001)000<0063:TTFHCT>2.3.CO;2. ^ a b c d e f g h "European Severe Weather Database". European Severe Storms Laboratory. 2013. Retrieved June 25, 2013. ^ Gottlob Burchard Genzmer (June 9, 2005). "Beschreibung des Orcans, welcher den 29. Jun. 1764 einen Strich von etlichen Meilen im Stargardischen Kreise des Herzogthums Mecklenburg gewaltig verwüstet hat" (PDF) (in German). Archived from the original (PDF) on October 31, 2005. Retrieved June 25, 2013. ^ a b "British & European Tornado Extremes". The Tornado and Storm Research Organisation. 2013. Retrieved June 27, 2013. ^ Grazulis, The Tornado, 255. ^ Grazulis, 'Significant Tornadoes', 609. ^ a b US Department of Commerce, NOAA. "Violent Tornadoes in Central and Southeast Illinois Since 1880". www.weather.gov. Retrieved December 13, 2018. ^ a b Grazulis, Significant Tornadoes, 612. ^ Grazulis, Significant Tornadoes, 615–16. ^ a b c d e f g h Brown, Eric (14 February 2013). "F5 Tornadoes: The Chronology – Part I". ^ a b c d e US Department of Commerce, NOAA. "First F5/EF5 Tornado in Iowa Since June 1976". www.weather.gov. Retrieved 10 February 2019. ^ Grazulis, Significant Tornadoes, 623. ^ "Rochester Tornado Aug 21 1883 Aftermath Photos". NOAA. 2008-08-19. Retrieved 2018-12-06. ^ "Rochester Tornado Aug 21 1883". August 21, 1883 Southeast Minnesota Tornadoes. NOAA. Retrieved 2018-12-06. ^ Grazulis, Significant Tornadoes, 628. ^ US Department of Commerce, NOAA. "Violent Tornadoes in Indiana". www.weather.gov. Retrieved December 13, 2018. ^ Grazulis, Significant Tornadoes, 658. ^ Grazulis, Significant Tornadoes, 663. ^ Grazulis, Significant Tornadoes, 664. ^ Sprague, F.W. (1893). Story of a Storm: A History of The Great Tornado at Pomeroy, Calhoun County, Iowa, July 6, 1893. ^ Grazulis, Significant Tornadoes, 667. ^ a b Grazulis, Significant Tornadoes, 670. ^ a b c d e Grazulis, Significant Tornadoes, 674. ^ Grazulis, Significant Tornadoes, 675. ^ "Death Rode the Gale; Several Texas Towns Visited by a Fearful Cyclone Yesterday". Leadville Daily and Evening Chronicle. May 16, 1896. ^ Piner, H. L. (1896). Sherman's Black Friday; May 15th, 1896: A History of the Great Sherman Tornado. Sherman, Texas: Register Printing House. pp. 18–20. ^ a b c d ExtremePlanet (17 January 2013). "The List of the Strongest Tornadoes Ever Recorded (Pre-1970): Part I". ^ US Department of Commerce, NOAA. "This Day in Weather History: May 15th". www.weather.gov. Retrieved 10 February 2019. ^ US Department of Commerce, NOAA. "This Day in Weather History: May 17th". www.weather.gov. Retrieved 9 December 2018. ^ Grazulis, Significant Tornadoes, 676. ^ US Department of Commerce, NOAA. "This Day in Weather History: May 25th". www.weather.gov. Retrieved 10 February 2019. ^ Grazulis, Significant Tornadoes, 684. ^ a b c Grazulis, Significant Tornadoes, 688. ^ a b "Query: New Richmond tornado". uwdc.library.wisc.edu. Madison, Wisconsin: University of Wisconsin Digital Collections Center. Archived from the original on November 12, 2014. Retrieved 2014-04-16. ^ "Freakish Work of the Wind at New Richmond". Oshkosh Daily Northwestern. Oshkosh, Wisconsin. The Associated Press. June 15, 1899. ^ Grazulis, Significant Tornadoes, 705. ^ "The Snyder, Oklahoma Tornado of 10 May 1905: Aftermath". Norman, Oklahoma: National Weather Service. 24 March 2014. Retrieved 9 December 2018. ^ US Department of Commerce, NOAA. "Tornadoes in and near Snyder, Oklahoma (1905-Present)". www.weather.gov. Retrieved 9 December 2018. ^ Grazulis, Significant Tornadoes, 706. ^ Grazulis, Significant Tornadoes, 708. ^ a b Grazulis, Significant Tornadoes, 713. ^ Grazulis, Significant Tornadoes, 715. ^ Grazulis, Significant Tornadoes, 717. ^ Grazulis, Significant Tornadoes, 732. ^ Grazulis, Significant Tornadoes, 735. ^ Grazulis, Significant Tornadoes, 737–738. ^ Grazulis, Significant Tornadoes, 744. ^ Frankenfield, H. C. (June 1917). "The Tornadoes and Windstorms of May 25–June 6, 1917" (PDF). Monthly Weather Review. Washington, D.C.: United States Weather Bureau. 45 (6): 291. Bibcode:1917MWRv...45..291F. doi:10.1175/1520-0493(1917)45<291:TTAWOM>2.0.CO;2. Retrieved 7 November 2014. ^ Grazulis, Significant Tornadoes, 751–752. ^ a b c Grazulis, Significant Tornadoes, 755. ^ a b Grazulis, Significant Tornadoes, 760. ^ a b c Kellenbenz, David (1 July 2009). "Fergus Falls F5 Tornado of June 22, 1919". Grand Forks, North Dakota: National Weather Service. Retrieved 16 April 2014. ^ Grazulis, Significant Tornadoes, 764. ^ a b c "Tornado Wrecked Town, Killing 60" (PDF). New York Times. New York City. June 24, 1919. Retrieved September 11, 2013. ^ a b Grazulis, Significant Tornadoes, 768. ^ Mitchell, Charles L. (April 1920). "Tornadoes of March 28, in Northeastern Illinois" (PDF). Monthly Weather Review. Chicago, Illinois: United States Weather Bureau. 28 (4): 191–196. Bibcode:1920MWRv...48..191M. doi:10.1175/1520-0493(1920)48<191b:TOMINI>2.0.CO;2. Retrieved August 25, 2013. ^ US Department of Commerce, NOAA. "Violent Tornadoes in Indiana". www.weather.gov. Retrieved 10 February 2019. ^ Grazulis, Significant Tornadoes, 769. ^ a b Smyth, P. H. (April 1920). "Tornadoes of April 20, 1920, in Alabama". Monthly Weather Review. Montgomery, Alabama: U.S. Weather Bureau. 48 (4): 205–210. Bibcode:1920MWRv...48..205S. doi:10.1175/1520-0493(1920)48<205:TTOAIA>2.0.CO;2. ^ "Destitution in wake of Alameda cyclone". Winnipeg Free Press. Winnipeg. July 24, 1920. ^ Grazulis, Significant Tornadoes, 773. ^ a b Hickmon, W. C. (April 1921). "Tornadoes of April 15, 1921, in Arkansas and Texas" (PDF). Monthly Weather Review. Little Rock, Arkansas: United States Weather Bureau. 49 (4): 194–196. Bibcode:1921MWRv...49..194H. doi:10.1175/1520-0493(1921)49<194:TOAIAA>2.0.CO;2. Retrieved September 10, 2013. ^ a b Grazulis, Significant Tornadoes, 782. ^ a b c d e f Gordon, John D.; Bobby Boyd; Mark A. Rose; Jason B. Wright (2000). "The Forgotten F5: The Lawrence County Supercell During the Middle Tennessee Tornado Outbreak of 16 April 1998" (PDF). National Weather Digest. National Weather Association. 24 (4): 3–10. Archived from the original (PDF) on 18 December 2012. The authors sent a detailed letter to the SPC recommending the two tornadoes from 1974, and the 1952 tornado mentioned above, be downgraded to F4. The SPC agreed to all three of these changes. The SPC database now reflects the conclusions of Professor Fujita's map of 1974, and Grazulis 1952 tornado report (1993). ... The authors suggested that the three former F5 tornadoes in Tennessee should be reclassified as F4. These changes have been adopted, making the 16 April 1998 Lawrence County tornado the only documented F5 in the history of Tennessee. ^ Grazulis, Significant Tornadoes, 783. ^ Grazulis, Thomas (17 April 2018). "North Dakota (Tweet 3 of 3 today).. ..6/24/1923 8k Hettinger F4 ranches looked like F5.. (tweet)". Retrieved 15 September 2018. ^ Grazulis, Significant Tornadoes, 792. ^ a b Grazulis, The Tornado, 195; 231. ^ Grazulis, Significant Tornadoes, 795–797. ^ a b c Mason, Angela (2011). Death Rides the Sky. ^ a b Johns, Bob (2012). The 1925 Tri-State Tornado's Devastation in Franklin County, Hamilton County, and White County, Illinois. ^ Johns, Robert H.; D. W. Burgess; C. A. Doswell III; M. S. Gilmore; J. A. Hart; S. F. Piltz (2013). "The 1925 Tri-State Tornado Damage Path and Associated Storm System". E-Journal of Severe Storms Meteorology. 8 (2): 1–33. Retrieved 2014-04-18. ^ US Department of Commerce, NOAA. "1925 Tornado". www.weather.gov. ^ US Department of Commerce, NOAA. "March Weather Facts". www.weather.gov. ^ a b Grazulis, Significant Tornadoes, 799. ^ Jarboe, J. H. (1927). "The Rocksprings, Texas, Tornado, April 12, 1927" (PDF). Monthly Weather Review. San Antonio, Texas: United States Weather Bureau. 55 (4): 182–183. Bibcode:1927MWRv...55..182J. doi:10.1175/1520-0493(1927)55<182:TRTTA>2.0.CO;2. Retrieved 18 April 2014. ^ Grazulis, Significant Tornadoes, 807. ^ US Department of Commerce, NOAA. "A list of the top 10 worst tornadoes in Texas history". www.weather.gov. Retrieved December 13, 2018. ^ Grazulis, Significant Tornadoes, 808. ^ "De cycloon van Neede, vandaag 90 jaar geleden". www.weer.nl. ^ "1927 Stormramp, Cycloon van Neede - FireBoard". www.weerstationhaaksbergen.nl. ^ a b c Grazulis, Significant Tornadoes, 820–821. ^ a b Grazulis, The Tornado, 77–81. ^ Grazulis, Significant Tornadoes, 238–247. ^ Grazulis, Significant Tornadoes, 824. ^ "The F5 Tornado of April 10, 1929". Little Rock, Arkansas: National Weather Service. Retrieved September 10, 2013. ^ US Department of Commerce, NOAA. "NWS Little Rock, AR - The F5 Tornado of April 10, 1929". www.weather.gov. Retrieved December 13, 2018. ^ Grazulis, Significant Tornadoes, 852. ^ Grazulis, Significant Tornadoes, 865. ^ "Apr 5, 1936: Tornadoes devastate Tupelo and Gainesville". History.com. Retrieved September 10, 2013. ^ Morse, W. M. (1936). The Tupelo Tornado (Technical report). University, Mississippi: Mississippi Geological Survey. 31. ^ US Department of Commerce, NOAA. "This Day in Weather History: April 5th". www.weather.gov. ^ Memphis, N. W. S. (5 April 2016). "TRIVIA: On April 5, 1936 a massive F5 tornado killed ~233 people in Tupelo, Mississippi. One notable survivor: 1 year old Elvis Presley". ^ a b "1936 tupelo tornado -". ^ Grazulis, Significant Tornadoes, 877. ^ a b Grazulis, Significant Tornadoes, 879. ^ Grazulis, Significant Tornadoes, 883. ^ Grazulis, Significant Tornadoes, 885. ^ Seeley, Mark W. (2006). Minnesota Weather Almanac. Minnesota Historical Society press. ISBN 0-87351-554-4. ^ Hovde, M. R. (June 1921). "The Champlin-Anoka, Minnesota Tornado" (PDF). Monthly Weather Review. Minneapolis, Minnesota: United States Weather Bureau. 67 (6): 176–178. Bibcode:1939MWRv...67..176H. doi:10.1175/1520-0493(1939)67<176:tcmt>2.0.co;2. Retrieved September 11, 2013. ^ Grazulis, Significant Tornadoes, 890. ^ Grazulis, Significant Tornadoes, 898. ^ US Department of Commerce, NOAA. "The Lacon F5 Tornado of March 16, 1942". www.weather.gov. Retrieved December 13, 2018. ^ Grazulis, Significant Tornadoes, 900. ^ Hein, Linda (December 22–23, 2001). "Oberlin tornado kills 15 in 1942". McCook Daily Gazette. McCook, Nebraska. Retrieved September 1, 2013. ^ "Top Ten Deadliest Oklahoma Tornadoes (1882-Present)". Srh.noaa.gov. Retrieved 2013-06-24. ^ "Windsor Tornado - June 17, 1946". Environment Canada. July 26, 2004. Archived from the original on January 11, 2003. Retrieved June 30, 2013. ^ "Survivors Wander Dazed and Helpless at Ruins". The Amarillo Globe-Times. Amarillo, Texas. April 10, 1947. ^ "Stunned Victims Unable To Comprehend Disaster". The Amarillo Daily News. Amarillo, Texas. April 11, 1947. ^ "Levi Holt Tells of Glazier Storm". The Hemphill County News. TX. April 25, 1947. ^ a b US Department of Commerce, NOAA. "Tornado Data, Information and Links". www.weather.gov. ^ US Department of Commerce, NOAA. "The Woodward Tornado of 9 April 1947". www.weather.gov. ^ a b Grazulis, Thomas (April 2003). The Tornado. The University of Oklahoma Press. ISBN 9780806135380. ^ "Violent Tornadoes (F4/F5/EF-4/EF-5) in Oklahoma (1950-Present)". NWS Norman, OK. NOAA. February 24, 2011. ^ "May 21, 1952 F4 Mississippi–Tennessee Event". National Climatic Data Center. Tornado History Project. 2013. Retrieved June 26, 2013. ^ a b Brown, Eric (15 February 2013). "F5 Tornadoes: The Chronology – Part II". ^ Ken; Kelley (June 8, 1953). "1953 Beecher tornado". NWS Detroit/Pontiac, MI. Retrieved September 11, 2013. ^ "Tornadoes Take 141 Lives, Ohio-Michigan Area Battered". The Times-Recorder. Zanesville, Ohio. June 9, 1953. ^ The Evening Gazette (June 10, 1953). "Tornado". The Evening Gazette. Retrieved September 16, 2013. ^ Toole, John M. (1993). Tornado! 84 Minutes, 94 Lives. Chandler House Press. p. 276. ^ US Department of Commerce, NOAA. "The Great Plains Tornado Outbreak and Blackwell Tornado of 25-26 May 1955". www.weather.gov. ^ "Storm report from the Udall tornado". National Weather Service. Retrieved April 7, 2017. ^ "1955 Udall Tornado | Wichita Eagle". Kansas.com. 2011-02-23. Retrieved 2013-09-15. ^ "Pictures from the Udall tornado". National Weather Service. Retrieved April 7, 2017. ^ "A Case Study in Forensic Meteorology: Investigating the 3 April 1956 Tornadoes in Western Lower Michigan | Ostuno | E-Journal of Severe Storms Meteorology". Ejssm.org. Retrieved 2013-08-31. ^ "1956 Tornado Outbreak: Vriesland to Trufant Tornado - Eyewitness Accounts". National Weather Service Grand Rapids, Michigan. Retrieved 2013-08-31. ^ "Ruskin Heights Tornado of May 20 1957". National Weather Service Pleasant Hills/Kansas City, Missouri. Retrieved April 7, 2017. ^ "Digital Horizons : Item Viewer". Digitalhorizonsonline.org. 1957-06-20. Retrieved 2013-08-31. ^ "The State of Wisconsin Collection". The State of Wisconsin Collection. State of Wisconsin. 1958. Archived from the original on December 24, 2013. Retrieved December 23, 2013. ^ "Wichita Falls, TX Tornado, Apr 1964 - Twister Slams Wichita Falls | GenDisasters ... Genealogy in Tragedy, Disasters, Fires, Floods". .gendisasters.com. Retrieved 2013-07-13. ^ "May 5, 1964: F5 Tornado Tracks From Adams To Butler County". NWS Hastings, NE. NOAA. May 1, 2014. Retrieved June 10, 2014. ^ "As the Sun Rose...Just Rubble". The Boston Globe. Boston, Massachusetts. April 13, 1965. ^ "Tornadoes belt Nebraska". The Tuscaloosa News. The Associated Press. May 9, 1965. Retrieved 25 November 2013. ^ "Four Dead In Twister". Daytona Beach Sunday News-Journal. The Associated Press. May 10, 1965. Retrieved 25 November 2013. ^ "Tornado Death Toll Reaches 4 At Primrose". Lewiston Morning Tribune. The Associated Press. May 10, 1965. Retrieved 25 November 2013. ^ a b "NWS Jackson, MS - Mar. 3, 2006 40th Anniversary of the Candlestick Park Tornado". National Weather Service Jackson, Mississippi. Retrieved 2013-07-13. ^ a b James Bonney (March 5, 1966). "Tornado Plows Horrible Swath; 60 Known Dead". Schenectady Gazette. Schenectady, New York. The Associated Press. Retrieved September 15, 2013. ^ "Washburn university Devastation and Recovery". Washburn.edu. Washburn University. Retrieved December 23, 2013. ^ "Personal Topeka Tornado Stories". Washburn.edu. Washburn University. Retrieved December 23, 2013. ^ "WheelersburgTornado 102". Sciotoville.org. Retrieved 2013-10-28. ^ Ryan, Bob. (June 14, 1968). KSTP Coverage of 1968 Tracy tornado (motion picture). Tracy, Minnesota: KSTP. Retrieved September 6, 2013. ^ "Tornado Observing tornadoes, dust devils, whirl winds, water spouts and land spouts". australiasevereweather.com. ^ "From domestic to international: Tornadoes around the world | United States Tornadoes". Ustornadoes.com. 2013-07-25. Retrieved 2013-08-31. ^ Viento Asesino (motion picture). Argentina: unknown. June 19, 2013. Retrieved August 26, 2014. ^ US Department of Commerce, NOAA. "Violent Tornadoes (F4/F5/EF-4/EF-5) in Oklahoma (1950-Present)". www.weather.gov. Retrieved 10 February 2019. ^ a b c d Fujita, T. Theodore; Abbey, Jr., Robert F. (1983) . "Chapter 3: Tornadoes: The Tornado Outbreak of 3–4 April 1974". In Kessler, Edwin (ed.). The Thunderstorm in Human Affairs (2nd ed.). Norman, Oklahoma: University of Oklahoma Press. pp. 37–66. ^ a b "Don Macy Photos of April 3, 1974". April31974.com. 1974-04-03. Archived from the original on May 22, 2013. Retrieved 2013-08-31. ^ "April 3, 1974". National Weather Service Louisville, Kentucky. Retrieved 2013-07-13. ^ "Tornado_Photos_from_Sayler_Park". April31974.com. 1974-04-03. Archived from the original on August 7, 2013. Retrieved 2013-08-31. ^ "Tornado Outbreak April 3 – 4, 1974" (PDF). NWS Wilmington, OH. NOAA. April 19, 1974. Retrieved April 9, 2013. ^ a b "Aerial Pictures from April 3-4th, 1974". NWS Huntsville, AL. NOAA. March 29, 2014. Retrieved March 30, 2014. ^ a b "April 3-4, 1974 Limestone County Tornado Damage". NWS Huntsville, AL. NOAA. March 29, 2014. Retrieved March 30, 2014. ^ Taylor, Dwight (April 4, 1974). "The Sky Turned a Funny Orange". Florence Times. Florence, Alabama. p. 1. ^ a b "Scene looks like work of monster". The Tuscaloosa News. Tuscaloosa, Alabama. April 5, 1974. Retrieved September 15, 2013. ^ Elliot, J.B (April 2, 2010). "The 1974 Super Outbreak". ABC33/40. Birmingham, Alabama. ^ a b Elliott, J.B. (October 13, 2006). April 3–4 Superoutbreak of tornadoes (motion picture). Alabama: ABC33/40. Retrieved January 4, 2013. ^ Jordan, Charles (March 29, 2014). "A Night to Remember" (PDF). NWS Huntsville, AL. NOAA. Archived from the original (PDF) on March 3, 2016. Retrieved March 3, 2016. ^ "March 26, 1976 F-5 SPIRO OKLAHOMA TORNADO". WebSpawner. 1976-03-26. Archived from the original on 2013-07-03. Retrieved 2013-07-13. ^ "Smithfield Tornado 4/4/1977". National Weather Service Birmingham, Alabama. Retrieved 2013-07-13. ^ Fujita, T. T.; Stiegler, D. J. (eds.). "Tornado Outbreak in the Upper Midwest on June 7-8, 1984". Storm Data. Asheville, North Carolina: United States Department of Commerce. 26 (6): 9–17. ^ "June 8, 1984 Barneveld, WI F5 Tornado". Milwaukee, Wisconsin: National Weather Service. 8 June 2012. Retrieved 14 April 2014. ^ Alimov, G.; A. Illesh; V. Kozlov; V. Korneyev (June 1984). "120 Minutes of a Tornado". Izvestia (in Russian). ^ Lyakhov, M. Y. (1986). "Tornadoes in the midland belt of Russia". Soviet Geography (in Russian). 6: 562–570. ^ Vasiliev, A. A.; B. E. Peskov; A. I. Snitkovskii (1985a). "Tornadoes on 9th of June 1984". Gidrometizdat (in Russian): 8–15. ^ a b Snitkovskii, A. L. (1987). "Tornadoes in the USSR". Meteorologiya I Gidrologiya (in Russian). 9: 12–25. ^ "Tornado Outbreak of May 31, 1985 - Pictures". Cleveland, Ohio: National Weather Service. 15 April 2002. Retrieved 14 April 2014. ^ a b Fujita, T. T.; Stiegler, D. J. (eds.). "Tornado Outbreak in the United States and Canada on May 31, 1985". Storm Data. Asheville, North Carolina: United States Department of Commerce. 27 (5): 5–16. ^ "Canada's Deadliest Tornadoes". Weather Doctor. Retrieved November 29, 2012. ^ Rogers, Edwards; James G. LaDue; John T. Ferree; Kevin Scharfenberg; Chris Maier; William L. Coulbourne (May 2013). "Tornado intensity estimation: past, present, and future". Bulletin of the American Meteorological Society. American Meteorological Society. 94 (5): 641–653. Bibcode:2013BAMS...94..641E. doi:10.1175/BAMS-D-11-00006.1. Retrieved 20 January 2014. ^ Smith, Michael (April 20, 1990). "Kansas twister might be the strongest ever recorded". Fort Scott Tribune. unknown: Fort Scott Tribune. Retrieved November 6, 2013. ^ Hagan, Maximilian. The List of the Strongest Tornadoes Ever Recorded: Part I. ^ "Storm Events Database - Event Details - National Centers for Environmental Information". www.ncdc.noaa.gov. ^ a b c d Fujita, T. T. (1993). Church, Christopher R. (ed.). "Plainfield tornado of August 28, 1990". Geophysical Monograph. Chicago, Illinois: University of Chicago. 79: 1–17. Bibcode:1993GMS....79....1F. doi:10.1029/gm079p0001. ^ a b Grazulis, The Tornado, 137. ^ "Kansas tornado survivors take 'shelter from the stormy blast'". Beaver County Times. The Associated Press. April 29, 1991. Retrieved September 8, 2013. ^ "Chandler-Lake Wilson Minnesota F5 Tornado of June 16, 1992 - Figure 6". Crh.noaa.gov. Archived from the original on December 8, 2014. Retrieved 2013-07-13. ^ Wakimoto, R. M.; Murphey, H. V.; Dowell, D. C.; Bluestein, H. B. (2003). "The Kellerville Tornado during VORTEX: Damage Survey and Doppler Radar Analyses". Monthly Weather Review. American Meteorological Society. 131 (10): 2197–2221. Bibcode:2003MWRv..131.2197W. doi:10.1175/1520-0493(2003)131<2197:TKTDVD>2.0.CO;2. ^ a b "Storm Events Database - Event Details - National Centers for Environmental Information". www.ncdc.noaa.gov. ^ "Oakfield, Wisconsin Tornado Storm report". Cimss.ssec.wisc.edu. 1996-07-22. Retrieved 2013-07-13. ^ "Jarrell, Texas Tornado Damage - May 27, 1997". K5kj.net. Retrieved 2013-09-15. ^ "Tuscaloosa Tornado of 4/8/1998". National Weather Service Birmingham, Alabama. Retrieved 2013-07-13. ^ Legates, David (1999). "WARNING RESPONSE AND RISK BEHAVIOR IN THE OAK GROVE - BIRMINGHAM, ALABAMA, TORNADO OF 08 APRIL 1998". Colorado.edu. University of Oklahoma. Retrieved January 2, 2014. ^ a b "April 16, 1998 Tornado Outbreak". National Weather Service Office in Nashville, Tennessee. National Oceanic and Atmospheric Administration. April 17, 2013. Retrieved October 23, 2013. ^ Hagan, Maximilian. The Highest Winds Ever Measured by Mobile Doppler Radar in Five Violent Tornadoes:. ^ "The Great Plains Tornado Outbreak of May 3-4, 1999 - Storm A Information". National Weather Service Norman, Oklahoma. Retrieved 2013-08-31. ^ a b c Jim LaDue; Tim Marshall & Kevin Scharfenberg (2012). "Discriminating EF4 and EF5 Tornado Damage" (PDF). National Weather Service Office in Norman, Oklahoma. National Oceanic and Atmospheric Administration. Retrieved June 26, 2013. ^ "Central Oklahoma Tornado Intercept: 3 May 1999 (Roger Edwards)". www.stormeyes.org. ^ a b Richards, Charles (May 14, 1999). "Oklahoma-size tornado hits unpopulated Hill Country". Amarillo.com. Amarillo-Globe News. Retrieved November 28, 2014. ^ "Storm Data and Unusual Phenomenon-May 1999" (PDF). cig.mesonet.org. American Meteorological Society. May 1999. Archived from the original (PDF) on March 11, 2014. Retrieved November 28, 2014. ^ "Oklahoma-size tornado hits unpopulated Hill Country - Amarillo.com - Amarillo Globe-News". web.archive.org. 3 March 2016. ^ "Texas Association of Broadcasters". www.tab.org. ^ a b Brown, Eric (25 June 2013). F5 Tornadoes: The Chronology – Part III. Eric's Weather Library. ^ "The Life and Death of Legendary Storm Chaser Tim Samaras". ^ Harper F-4 NWS Damage Survey Video (Motion Picture). May 12, 2004. Retrieved February 27, 2018. ^ Marshall, Timothy P. Marshall; McCarthy, Daniel; LaDue, James. Damage survey of the Greensburg, KS tornado (PDF). ^ Elie Tornado Upgraded to Highest Level on Damage Scale: Canada's First Official F5 Tornado Archived 2011-06-11 at the Wayback Machine Environment Canada Accessed May 27, 2008. ^ a b "Details of the Parkersburg Storm Damage Survey" (PDF). Des Moines, Iowa: National Weather Service. Retrieved September 8, 2013. ^ "Parkersburg EF5 Damage". mesonet.agron.iastate.edu. NWs Des Moines. May 26, 2008. Retrieved January 12, 2015. ^ a b "Neshoba/Kemper/Winston/Noxubee Counties Tornado". srh.noaa.gov. Jackson, Mississippi: National Weather Service. Retrieved 8 November 2014. ^ "Smithville, MS EF-5 Tornado". Memphis, Tennessee: National Weather Service. 30 May 2011. Retrieved 14 April 2014. ^ a b "April 2011 Tornado Response Imagery". Ngs.woc.noaa.gov. Retrieved 2013-09-15. ^ "NWS Southern Region News - Smithville, Mississippi EF5 Tornado Damage". ^ "Smithville, MS Tornado presentation". Richard Okulski. NWS Memphis, TN. October 17, 2011. Retrieved March 4, 2014. ^ a b "Hackleburg (Marion County) EF-5 Tornado April 27, 2011". srh.noaa.gov. Birmingham, Alabama: National Weather Service. Retrieved 8 November 2014. ^ a b c d "Franklin (AL) / Lawrence / Morgan / Limestone / Madison / Franklin (TN) EF-5". srh.noaa.gov. Huntsville, Alabama: National Weather Service. Retrieved 8 November 2014. ^ "NWS Damage Assessment Toolkit". apps.dat.noaa.gov. NOAA. Retrieved June 23, 2014. ^ a b McCaul, Eugene W.; Knupp, Kevin R.; Darden, Chris; Laws, Kevin. Extreme damage incidents in the 27 April 2011 tornado superoutbreak (PDF). ^ "National Weather Service Huntsville, AL - DeKalb County Survey Information". Srh.noaa.gov. Retrieved 2013-08-31. ^ a b "National Weather Service Springfield, MO - Event Review - May 22, 2011". Crh.noaa.gov. Retrieved 2013-08-31. ^ "New Engineering Study Finds No EF5 Damage in Joplin - weather.com". ^ Sarkar, Parka; Marshall, Timothy (November 7, 2012). "Supplemental Damage Indicators Discovered in Recent Strong Tornadoes". ams.confex.com. American Meteorological Society. ^ Marshall, Timothy; Ladue, Jim (2011). "Performance of residences and shelters in the Oklahoma tornadoes of 24 May 2011". ams.confex.com. American Meteorological Society. Retrieved August 29, 2014. ^ "Tornado B2 - The Calumet-El Reno-Piedmont-Guthrie Tornado of May 24, 2011". ^ a b Ortega, Kiel. Overview of the 24 May 2011 tornado outbreak. ^ Gardner, Jim (May 24, 2011). Tornado Hits Producing Location-Oklahoma (motion picture). Oklahoma: KFOR. Retrieved January 20, 2014. ^ "The Chickasha-Blanchard-Newcastle Tornado of May 24, 2011". National Weather Service Office in Norman, Oklahoma. National Oceanic and Atmospheric Administration. July 12, 2011. Retrieved June 26, 2013. ^ "Damage Assessment Toolkit". apps.dat.noaa.gov. NOAA. May 24, 2011. Retrieved August 30, 2014. ^ "Storm Events Database - Event Details | National Climatic Data Center". National Climatic Data Center. National Oceanic and Atmospheric Administration. 2011-05-24. Retrieved 2013-09-15. ^ "The Washington-Goldsby Tornado of May 24, 2011". NWS Norman, OK. NOAA. Retrieved August 31, 2014. ^ Marshall, Tim; Ortega, Kiel (February 5, 2014). "Damage Survey and Analysis of the 20 May 2013 Newcastle-Moore, OK, EF-5 Tornado (Presentation)" (PDF). American Meteorological Society. Retrieved March 12, 2014. ^ "The Tornado Outbreak of May 20, 2013". National Weather Service Norman, Oklahoma. May 21, 2013. Retrieved May 23, 2013. ^ Marshall, Tim; Ortega, Kiel (February 5, 2014). "Damage Survey and Analysis of the 20 May 2013 Newcastle-Moore, OK, EF-5 Tornado". American Meteorological Society. Retrieved March 12, 2014. ^ "Damage Assessment Toolkit". apps.dat.noaa.gov. NOAA. May 20, 2013. Retrieved November 25, 2014. ^ Welch, Trevor (May 20, 2014). May 20th, 2013 Oklahoma tornado damage about 1 hour after (motion picture). Moore, Oklahoma: Trevor Welch. Retrieved September 4, 2014. ^ Forbes, Greg; Daniel, Matt (September 5, 2013). "Why was El Reno, Oklahoma tornado downgraded to EF3?". EarthSky.org. unknown. Retrieved November 5, 2013. ^ a b Marshall, Timothy (November 6, 2014). "Damage Survey of the Mayflower-Vilonia, Arkansas Tornado". ams.confex.com. American Meteorological Society. Retrieved December 11, 2014. ^ Brantley, Max (May 5, 2014). "Meteorologist defends EF4 rating on Vilonia tornado". Arkansas Times. Arkansas Times. Retrieved March 4, 2015. ^ "April 27, 2014 Arkansas tornado surveys" (.KML). National Weather Service Office in Little Rock, Arkansas. National Oceanic and Atmospheric Administration. May 1, 2014. Retrieved May 2, 2014. ^ Gordon, Kalani (April 30, 2013). "Aerial assessment of southern states tornado damage". The Dark Room. The Baltimore Sun. Retrieved March 4, 2014. ^ "Video: Aerial footage of Mayflower, Vilonia tornado". thecabin.net. The Log Cabin Democrat. April 28, 2014. Retrieved March 13, 2015. ^ a b "NWS Damage Assessment Toolkit". apps.dat.noaa.gov. ^ Omitt, Chad (February 19, 2016). Tornado Talk Podcast Episode 29 - Top 10 of 2016 Part 2 (Enhanced Version) (motion picture). Retrieved November 5, 2017. ^ US Department of Commerce, NOAA. "Wednesday, May 25th, 2016: Long Track Tornado Hits North Central Kansas". www.weather.gov. Retrieved 10 February 2019. Grazulis, Thomas P. (1993). Significant Tornadoes, 1680-1991: A Chronology and Analysis of Events. St. Johnsbury, Vermont: Environmental Films. ISBN 1-879362-03-1. — (2001). The Tornado: Nature's Ultimate Windstorm. University of Oklahoma Press. ISBN 978-0-8061-3538-0. This page was last edited on 17 April 2019, at 00:05 (UTC).